Cervical fusion of the mid-cervical spine is a surgical procedure performed to mechanically fixate the cervical spine between C3 and C7. The operation is used to fixate one level or many levels of the cervical spine. It is a common procedure for patients who have significant disk damage and/or radiculopathy, rheumatoid arthritis in the neck, or who have had trauma to the cervical spine and require internal fixation to restore stability. Following is a description of the procedure, presentation, and treatment guidelines for patients who have undergone cervical fusion of the mid-cervical spine. The cervical spine consists of 7 vertebrae from C1-C7. The first disk (highest) is between C2 and C3. Nerve roots exit each level of the spine and can become compressed if there is a disk herniation. The vertebral arteries run parallel to the cervical spine through the transverse foramen of the cervical vertebrae. The cervical spine is stabilized by surrounding musculature and ligaments on the anterior, posterior, and lateral sides of the vertebral column. A recent study investigating the prevalence of anterior cervical decompression and spine fusion (ACDF) found that 157/100,000 (0.157%) Americans had undergone anterior fusion of the cervical spine.6 The actual prevalence of cervical fusion is higher than this, since fusion from the posterior neck is also an option that is sometimes utilized when a fracture is present, but anterior cervical fusion is the most common method. Mid cervical fusion significantly improves the range of motion in patients with cervical instability.7 Patients who have had a fusion, however do not achieve the same range of motion as people without cervical spine problems. The number of vertebrae fused together determines the amount of motion they may be missing compared to normal values. Since much of the motion in the neck (flexion, extension, rotation, lateral flexion) occurs in the upper cervical spine, a person with only one or two fusions in the mid cervical spine may not have any noticeable deficits without measuring with a goniometer. A patient with several fusions in the mid cervical spine may lack motion in all directions and present with a "stiff neck," moving their entire torso in order to change the position of their head. The initial evaluation following a mid cervical fusion will be relatively simple to assess, since the physical therapist is not trying to diagnose anything, and will have all of the surgical results and specific instruction from the surgeon. The therapist will gently measure the patient's range of motion and assess levels of pain. Special tests will include assessment of the vertebral artery if the patient has any symptoms of dizziness or fainting, and a neurological assessment if there is any pain, weakness, numbness, or tingling in the upper extremities. There are two main options for surgically fusing the mid cervical spine – the anterior and the posterior approach. The anterior approach is more commonly performed because the surgeon is able to expose the vertebral bodies more easily and plate them together. Fusion from the posterior neck is usually done by wiring the spinous processes or the transverse processes together. 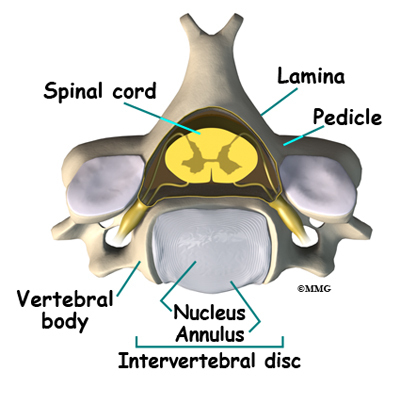 Factors to consider when deciding upon the anterior or posterior approach include location of possible disc protrusion, number of vertebrae to be fused, and surgeon preference. Before the surgery the surgeon must harvest a bone allograft, most often from the iliac crest, to insert between the two vertebrae being fused. The intervertebral disc is removed (discectomy) and the bone graft is inserted into the remaining space. The fusion is reinforced by plates and screws into the vertebral bodies, or by wiring the spinous processes or transverse processes. After surgery, patients generally have an immediate decrease in neck pain. Possible surgical complications include temporary hoarseness and dysphagia, damage to the esophagus, trachea, spinal cord, nerve roots, wound infection, and pseudoarthrosis (nonunion of fusion).11 The hip will probably be sore if it was the donor site of the bone graft. Patient is advised not to lift more than 22 lbs. until one year post-op. Ice is the most commonly used modality following a mid cervical fusion - it is used after many types of surgeries to control the inflammation that results from the incision and trauma of the operation. It is also effective for pain management by slowing the nerve conduction velocity13, and may contribute to the gate theory of pain: the theory that the perception of pain can be decreased by stimulating other nerve endings and "closing the gate" to pain signals in the nervous system. Ice pack is a very safe modality - it should be applied in intervals with a towel between the skin and the ice pack to avoid extremely low temperatures of the skin. Some online health guides claim that electrotherapy is contraindicated over metal hardware in the body, but there is not literature to support this contraindication. The International Society for Electo Physical Agents (ISEPA) does not contraindicate using TENS over metal hardware15. There are some contraindications for TENS however, and it should be used with care. TENS should not be applied until several days after the operation; not until the incision is closed, inflammation is under control, and the site is clear of infection. The electrodes should not be placed directly over the spine, and should not be placed on the anterior neck. TENS therapy should never be used on a patient with a pacemaker, as the electrical signals can interfere with the proper functioning of a pacemaker. A third modality that may be useful for a patient with mid-cervical fusion is heat. Heat should not be applied until at least 10 days after the operation and after the incision site is closed, free of infection, and healing well. Heat can be an effective pain management tool by relaxing muscles, and reducing spasm. It can also increase blood flow to the area through local vasodilation. Heat should not be applied to the front of neck over the carotid arteries. Heat is contraindicated over superficial metal implants (to avoid risk of overheating the metal), but would be safe if applied to the posterior neck for an anterior fusion. Heat from heat packs does not penetrate more than about one inch. Sufficient layers of towels should be placed between the patients skin and the heat pack to avoid excessive skin temperatures. Ultrasound therapy is contraindicated over metal hardware, due to the risk of overheating the metal components. 6.Marawar S, Girardi FP, Sama AA, Ma Y, Gaber-Baylis LK, Besculides MC, Memtsoudis SG. National trends in anterior cervical fusion procedures. Spine (Phila Pa 1976). 2010 Mar 5 [Epub ahead of print]. 8. Spinasanta S. Cervical Plates: Provide Neck Stability Using Spinal Instrumentsation. http://www.spineuniverse.com/exams-tests/devices/cervical-plates-provide-neck-stability-using. Updated October 28, 2010. Accessed December 4, 2010. 10. Ullrich PF. Posterior Cervical Decompression (Microdiscectomy) Surgery. http://www.spine-health.com/treatment/back-surgery/posterior-cervical-decompression-microdiscectomy-surgery. Updated Jan 8, 2010. Accessed December 4, 2010. 11. Brown C., Eismont F. Complications in spinal fusion. Orthopedic Clinics of North America. 12. Bhatnagar MK, et al. Spinal Fusion and Rehabilitation Aftercare. http://www.simmonsortho.com/literature/spinalfusionandrehab/spinalfusionandrehab.html. Updated 2007. Accessed December 5, 2010. 14. Johnson M, Martinson, M (2006). Efficacy of electrical nerve stimulation for chronic musculoskeletal pain: A meta-analysis of randomized controlled trials. Pain 130 (1): 157–165.